were as yet revealed at the poll last Saturday and Thursday. This has thusly brought for worries over INEC's ability to stem the revolting tide. Less than 24 hours before the Osun State governorship election last Saturday, the Independent National Electoral Commission called a gathering full of journalists and local and international election observers at Osogbo, the state capital. There, the state Resident Electoral Commissioner, Mr. Olusegun Agbaje, spoke in stern tone, saying the commission was fully prepared to conduct an election that would be free of vote-buying. He vowed the commission was ready to use the election to make a bold statement against the “monster,” which had marred previous elections in the country, including the recently held governorship election in Ekiti State, where widespread vote-buying and vote-selling cases were recorded. Agbaje also warned politicians and voters against vote-buying and vote-selling respectively, saying the commission was ready to unleash the full wrath of the law against anyone found doing so. “Politicians must not induce voters with money during the election and voters must only vote for the candidate of their choice while resisting any attempt by anyone to buy their votes,” he said. The REC went on to list the penalties for those caught in the act of vote-buying. He cited, “For the avoidance of doubt, Section 24 of the Electoral Act (as amended) states that a person who gives voters money to vote for or refrain from voting for a candidate is liable on conviction to a fine of N500,000 or 12 months imprisonment. By the electoral commissioner’s threats against vote-buyers, anyone at the gathering would perhaps be fully convinced that INEC had truly perfected all plans to curb the plague, more particularly as the commission’s Chairman, Prof. Mahmood Yakubu, had earlier stated it was working with security agencies, including the Economic and Financial Crimes Commission, to check vote-buying. He said, “We are here as part of our consultations with critical agencies that are connected to the electoral process. We have undertaken a number of innovations to strengthen the electoral system and these days, you hear less of ballot box snatching and kidnapping of INEC officials. But as we solve one problem, another one is coming up. “Of immediate concern is the election we are holding on Saturday (September 22) in Osun State and it is going to be the last major election before the 2019 general elections. 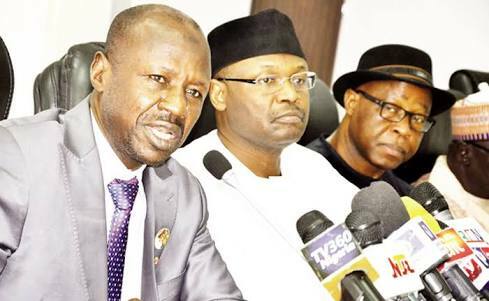 Assuring the INEC chairman of the EFCC’s support, the anti-graft agency’s Chairman, Mr. Ibrahim Magu, said, “There’s indeed a lot of concern about vote-buying and -selling. There’s also a lot of concern about the possibility of moneybags trying to derail our democracy and democratic process. Prior to its partnership with the EFCC, the electoral commission had also forged alliances with the police and the Independent Corrupt Practices and other relatedoffences Commission to tackle vote-buying during the Osun State governorship election. On September 10, Yakubu had requested the acting ICPC Chairman, Mr. Musa Abubakar, to deploy its operatives to arrest and prosecute vote-buyers in the Osun State governorship election. “INEC is determined to deal with the problem of vote-buying. We have called on the citizens to report any form of vote-buying. The commission is determined to introduce an inter-agency framework for the collaborative effort in tackling this issue,” Yakubu said. However, despite INEC’s vow to use the Osun State governorship election to make a strong statement against vote-buying, several incidents were reported across the 30 local government areas of the state. A day before the election, some of the governorship candidates and their political associates had devised several means to induce voters with cash ahead of the poll. Representatives of at least one of the contestants even used the WhatsApp social media platform to woo Permanent Voter Card holders to sell their votes. The associates of a contestant had set up a WhatsApp number, 08120569530, where the voters were asked a series of questions to ascertain if they actually had PVCs and were Osun State indigenes. After making enquiries from a potential vote-seller, the administrator of the WhatsApp line had then promised that N10,000 would be deposited into their account number at 6am on the election day, after sending their account details, age, town, ward and unit to claim the amount. One of the election contestants was said to have even started distributing money to the party’s ward leaders, who would identify the names of their party members on the voter registers and pay them ahead of the poll. Also, the sponsor of another candidate was said to have compelled some party leaders to swear an oath that they would spend the money he wanted to give them to induce voters and not pocket them. Some of the leaders were said to have agreed while a few of them were said to have rejected the money because they could not swear the oath of allegiance. The same candidate was said to have also distributed forms to prospective voters with PVCs, asking them to fill in their accounts details to enable them to be credited with the sum of N10,000. The amount is said to be meant for any voter with a PVC. And then, on the election day, several cases of vote-buying were reported while some were witnessed firsthand by our correspondent – from Osogbo, to Iragbiji, to Ikirun, to Iwo, to Ede and Ilesa, among several other towns in the state. Some of the political parties’ agents were seen handling cash brazenly, close to the polling units and sharing among those who had voted for their parties. Speaking to our correspondent, a voter at Ward 9, Unit 3 at Osogbo, simply identified as Akeem Osuntokun, said he was also lured to sell his vote but rejected it because he didn’t want to sell his future. He said, “All the three major parties lured me with sums ranging from N2,000 to N5,000. I rejected their offers because I wasn’t willing to sell my vote again. I did during previous elections. An Osogbo-based lawyer and social commentator, Mr. Matthew Asubiojo, noted that vote-buying during the Osun State governorship election wasn’t in any way different from the Ekiti State scenario. He said, “I thought we had seen the end of it all at Ekiti State until it happened in my very own state. I was surprised because I was convinced that INEC would really stop it. “The commission boasted and made lots of threat against it, but it was like those threats were empty. Nothing was curbed, nothing was reduced. I think it was even more pronounced at the Osun election. “You know it didn’t start with Ekiti State. We have had it in Anambra State, and before Anambra State, Edo State. But initially it had always been done discreetly; voters wouldn’t dare queue up near a polling unit to collect money from party agents. “But just like it happened in Ekiti, it happened last week in Osun. I think INEC still has a long way to go. It is not by making threats but by really carrying out the threats. Although the Osun electorate were advised against selling their votes by different national and international bodies, including the European Union, a public affairs analyst in Lagos, Mr. Suleiman Kingsley, said poverty could sometimes make people do what they never imagined they would do. He however doubted INEC’s capacity to close all loopholes making vote-buying to be possible ahead of the 2019 general elections, having failed to prevent it during the Osun election. He said, “Vote-buying stems from poverty, while poverty is caused by poor governance. In a way, INEC can’t stop vote-buying because those behind it are the employers of the commission’s leadership. “While I am not making any allegations, but our rulers are the ones who appoint the commission’s chairman, so in a way, INEC can’t prevent it, except if its boss wants to lose his job. He must bend to the demands of his employer. He added, “Another thing is poverty, as I said before. Look at the Osun scenario: it’s not an economically buoyant state, most residents rely on salaries, which have not been even paid regularly. So, if a politician promises to give you N10,000 in just a day for just voting for them, you might not think twice before saying yes. That was what happened. Nevertheless, Kingsley urged INEC not to think of its failure to curb vote-buying in Osun State but do everything in its power to fight against it at the 2019 general elections. “And I think the electorate should also love themselves and stop selling their future because of a morsel of bread,” he added.